Just take a look at this Lone Star Western Decor exclusive! With a silver and turquoise stone border and leather-textured center, these polyresin switch plate covers add spirited western style to your room. For even more products, we invite you to take some time to review our whole inventory of switch plate covers at Lone Star Western Decor now. Just have a look at this Lone Star Western Decor exclusive! 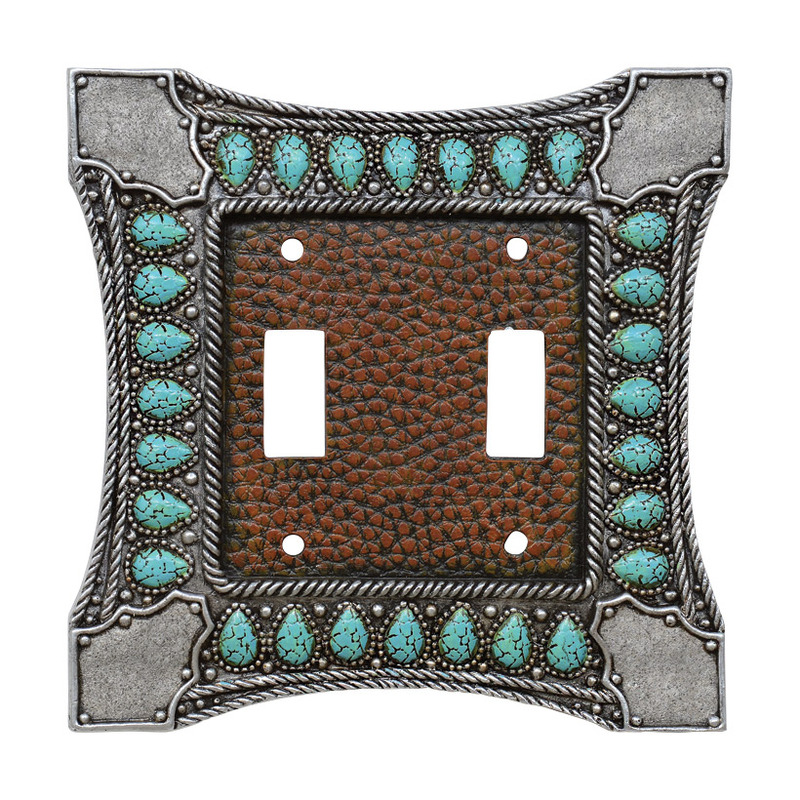 With a silver and turquoise stone border and leather-textured center, these polyresin switch plate covers add spirited western style to your room. 5"W x 3 1/2"H. For even more pieces, we encourage you to take some time to look through our full assortment of switch plate covers at Lone Star Western Decor today. Check out this Lone Star Western Decor exclusive! With a silver and turquoise stone border and leather-textured center, these polyresin switch plate covers add spirited western style to your room. 5"W x 5"H. For further items, we invite you to take a moment to shop our extensive selection of switch plate covers at Lone Star Western Decor today. Take a look at this Lone Star Western Decor exclusive! With a silver and turquoise stone border and leather-textured center, these polyresin switch plate covers add spirited western style to your room. 5"W x 3 1/2"H. For more offerings, we invite you to take the occasion to review our whole inventory of switch plate covers at Lone Star Western Decor now. Have a look at this Lone Star Western Decor exclusive! With a silver and turquoise stone border and leather-textured center, these polyresin switch plate covers add spirited western style to your room. 5"W x 5"H. For even more offerings, we ask you to spend some time to check out our whole array of switch plate covers at Lone Star Western Decor now. Just look at this Lone Star Western Decor exclusive! With a silver and turquoise stone border and leather-textured center, this polyresin outlet cover adds spirited western style to your room. These switch plate covers measure 5"W x 3 1/2"H For even more pieces, we encourage you to take a moment to go through our thorough inventory of switch plate covers at Lone Star Western Decor today.